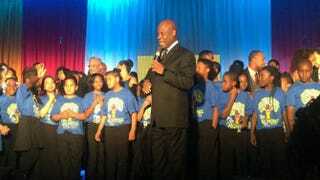 Wintley Phipps performs with the Dream Kids and the Takoma Academy Chorale at the U.S. Dream Academy's 15th annual Power of a Dream Gala on May 3, 2016, in Washington, D.C.
Wintley Phipps is a force of nature, standing amid a children’s choir, belting out the gospel classic “He’s Got the Whole World in His Hands.” The performance, at Tuesday night’s 15th annual Power of a Dream Gala, was for a glittering crowd gathered to share his passion for keeping at-risk children out of prison. On Tuesday night at the Washington Renaissance Hotel in D.C., the Grammy-nominated Phipps shared that passion with like-minded people, who came to support the U.S. Dream Academy, which he founded in 1998. The national after-school program is aimed at breaking the cycle of children following their incarcerated parents into prison through education, mentoring and technology-driven activities. It currently operates in seven cities, including Orlando, Fla., Salt Lake City and Washington, D.C.
For Phipps, the motivation to create the project was very personal. Phipps’ wife, Linda Galloway, was mentored by a neighborhood Christian family who sent her away to school, which allowed her to eventually become a registered nurse. Phipps says that the U.S. Dream Academy, through a program that involves everything from mentoring to academic skill building and character building, helps over 700 kids per day and has touched the lives of thousands. He cites the story of two twins from Philadelphia: Kwame and Quentin. At the ceremony Tuesday night, Jaime Casap, global education evangelist at Google, received the President’s Award for his work on education; Rep. Bobby Scott (D-Va.) received the Legacy Award for his work with children and criminal-justice reform; and Jarrett Adams received the MLK Jr. Award. Adams was wrongfully convicted of sexual assault at the age of 17 and sentenced to 28 years in prison. He was released after 10 years after battling for justice, graduated from the Loyola University Chicago School of Law and founded his own organization, Life After Justice. Adams says that he’s focused on helping people who have come home from prison and need access to education and a trade so that they can provide for themselves. Adams says that people who read about his success should understand that his story is amazing, but it can be duplicated. He stresses, however, that it was hard work and that education is key to everyone’s success. Rep. Scott, who says that he is honored to have received an award from an organization that focuses on at-risk children, notes that this is a much better way of dealing with crime than the traditional bidding wars that erupt over who can impose the harshest sentence. Scott says that there are several pieces of legislation being considered on Capitol Hill that could help, including the Youth PROMISE Act, to help get young people on the right track, and the SAFE Justice Act, which would reduce mandatory minimums. Phipps cites statistics showing that 60 percent of black boys in the U.S. who don’t graduate from high school will be in prison by age 30. That’s among the problems the U.S. Dream Academy is trying to address.